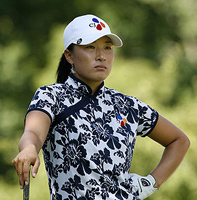 Se Ri Pak is a South Korean professional golfer, playing on the LPGA Tour. She was inducted into the World Golf Hall of Fame in November 2007. 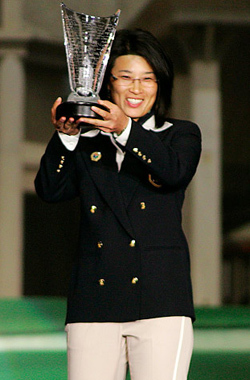 Pak turned professional in 1996, a year before she moved to the United States as a 20-year-old. 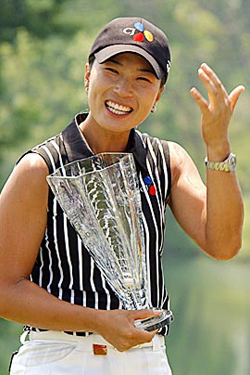 In 1996 and 1997 she won six tournaments on the Korean LPGA (KLPGA) Tour. 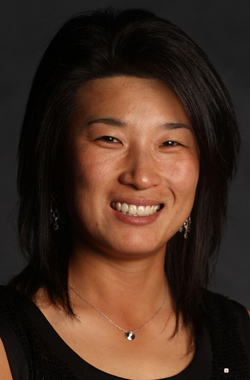 Pak joined the LPGA Tour full-time for the year 1998, crowning her rookie season with victories in two majors: the McDonald's LPGA Championship and U.S. Women's Open. She won the Rolex Rookie of the Year award for that season. Since then she has gone on to win 24 events on the Tour, including three more majors. In June 2007, at age 29, she qualified for the World Golf Hall of Fame, surpassing Karrie Webb as the youngest living entrant ever. Tom Morris, Jr., who died in 1875 at the age of 24, was elected in 1975. Pak has also competed in a professional men's event, at the 2003 SBS Super Tournament on the Korean Tour. The Korean Tour is a feeder tour for the Asian Tour and does not offer world ranking points. She finished 10th in the event. At the 2005 LPGA Championship she missed the cut for the first time in 29 majors. In an interview quoted on the PGA Tour's website she commented that she was searching for a balance between her golf and her personal life: "I've been a little bit unhappy about everything, my game, big game. I'm not really enjoying it at all, and I'm not doing anything with my ability. I know what I needed, a much better balance. I'm always putting a lot of pressure on myself". Eventually, she was found to have a finger injury. In 2006 she rediscovered her best form by winning the LPGA Championship for the third time to claim her fifth major title overall. In 2007, she won the Jamie Farr Owens Corning Classic for the fifth time, making her the third player in LPGA history to win the same tournament five or more times.